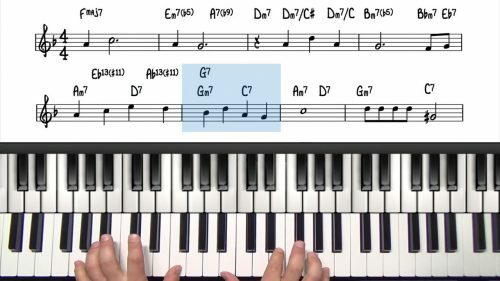 Welcome to the first blues standard tutorial on the famous tune "Straight No Chaser" by Thelonious Monk. "Straight no Chaser" is most often played in the key of F, so it’s an F Blues. 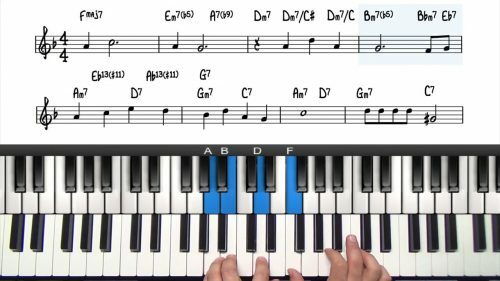 Its very closely related to the standard jazz blues so if you are familiar with that set of chord changes you will have no problems learning the form and harmony for this tune. The most interesting thing about "Straight No Chaser" is the displacement of the melody. The main melodic motif if the head is an ascending phrase that’s repeated throughout but placed on different beats of the bar. We’ll approach it at a medium tempo of about 120 bpm. At this tempo we will play once through the head, and then move straight into some improvisation. 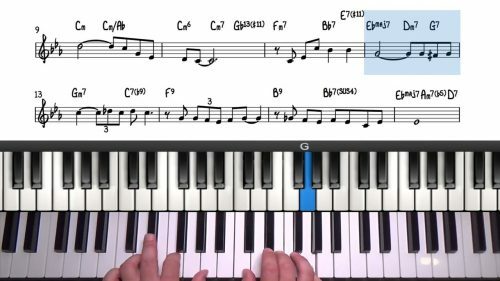 You should be aware that if you were playing at faster tempos, it’s common to play the head twice before moving into the improvised sections. I’m going to play the melody exactly as it’s written but I will be playing with a swing feel. We are going to incorporate everything we have studied with the blues so far. One recommendation would be think about the dynamics of your solo. For example you don’t want to start of with your best stuff, keep it simple to begin with and remember that a great solo will develop into a climax and gradually wind back down. Check out the poll in the forum where you can vote on the blues tunes and theory topics that you want to see on the website. Share and discover your favourite blues records and take part in the transcription exercises to develop your improvisation skills. Most often played as a ballad, this is a great tune to incorporate bluesy licks and riffs. It’s written in the key of Eb Major and has an AABA form. Continually think about how you will build tension and then release the tension. Ultimately, you are telling a musical story and creating a narrative, remember that the best improvisations sound like melodies. Repetition and motif development play an essential role.